Remember “Show and Tell”? Yeah, me too. One of the best parts of the week for a grade schooler! All week long, you wait for Friday, when you can bring that special something to school, that something that makes you so happy that you just have to show everyone! That’s how I feel about fabric. 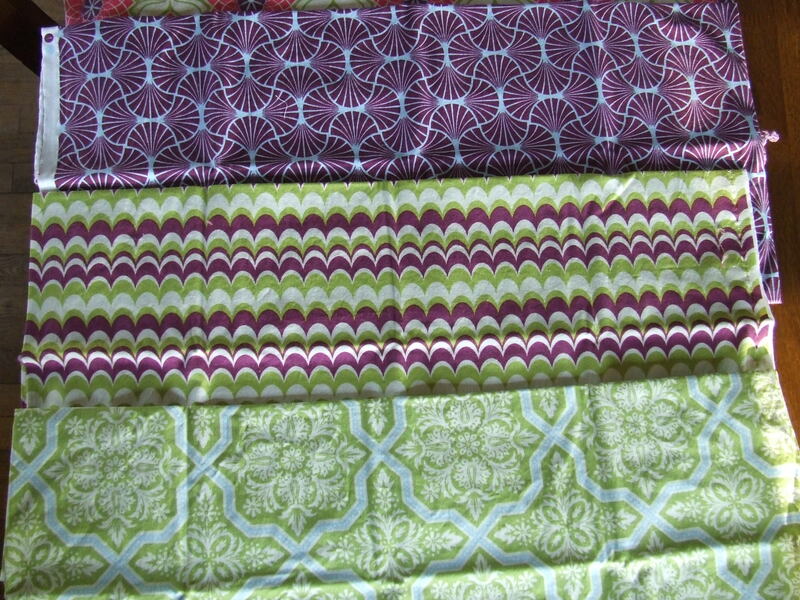 I buy fabric sometimes for an intended project, but sometimes just because it’s wonderful and beautiful and catches my eye, knowing that eventually it will want to be made into something lovely. Fabric junkies call this the “stash”. It’s a collection, really, like baseball cards or stamps or coins (or peacocks or snow people or antique dishes or those carved wooden figures). So, let’s have grown-up show and tell on Friday! I shall try and make this a regular occurrence. I will show and tell some fabric, and you can show and tell (if you have a blog) or just tell (in the comments) fabric or anything you’re loving right now. 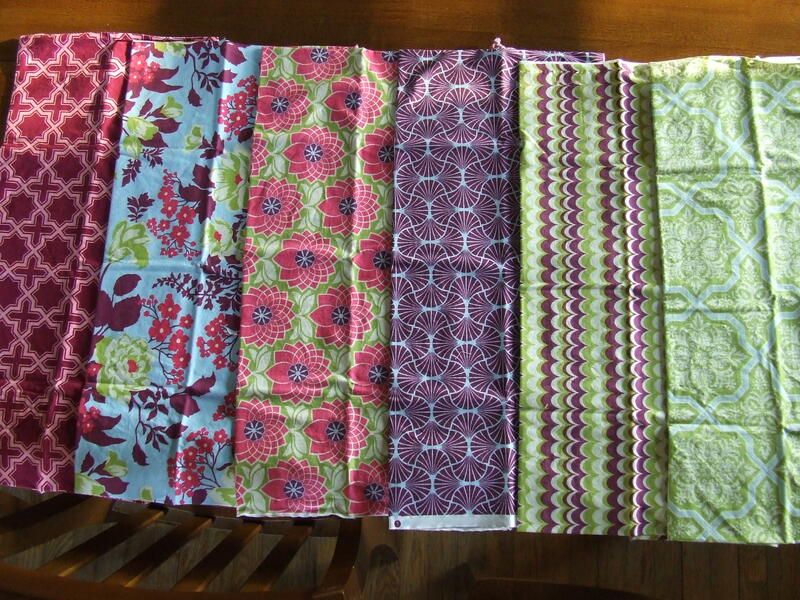 These are all fabrics by Joel Dewberry. The one on the left is from a collection called Meadow Sweet, but the colors work nicely with the rest, which are all from the Heirloom collection. From top to bottom: empire weave, marble stripe, tile flourish (all from the Sapphire palette of Joel Dewberry’s Heirloom collection). So tell me: what do you collect? Or show me some fabric! 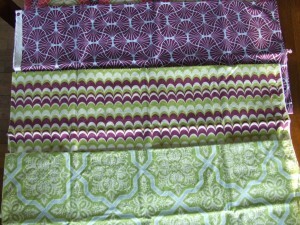 Also tell me: should I iron these fabrics before I take a picture, or does it not matter? I’m just going to fold them back up because I’m not currently making anything with them! No don’t iron them!! Unless you are going to use them. Ironing is no fun! I have the same problem with ribbon. I even had Randy make me a ribbon rack that is 4ft high and 4ft wide so that I can spool them on and unroll to my hearts content. It also make it easier to match colors. I am always looking for the next sale. 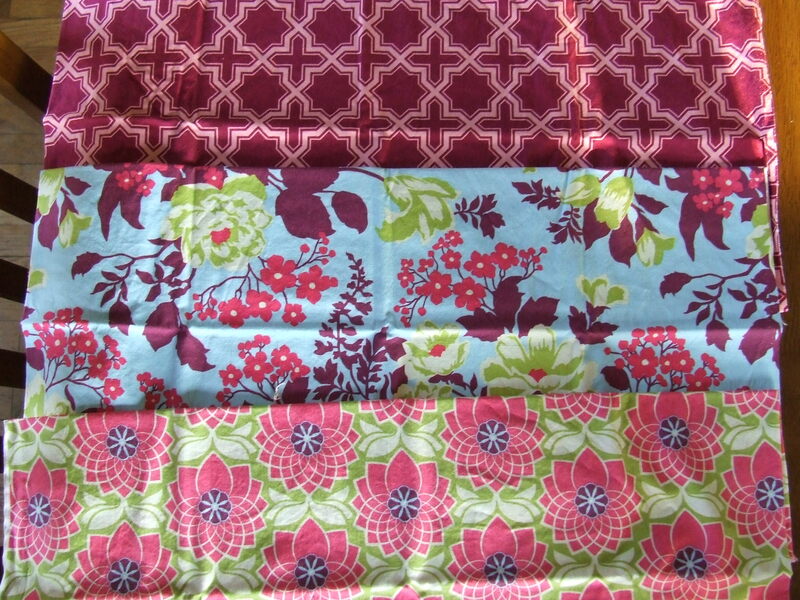 I have found a cool website that even sells beautiful fabrics. http://www.theribbonretreat.com. I am a sucker for ribbon. However, I am making so many that I need to find local salons or advertise. Have any ideas? I meant to say so many hairbows made to sell not ribbon to sell. Any takers. I will ship. I love that fabric! I also have a stash. 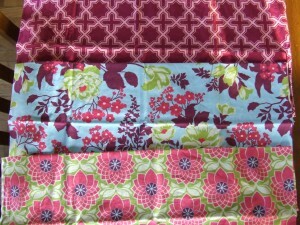 I can easily spend hours wandering through a fabric store. I have been trying to stay out of fabric stores until I use some of what I already have, we just don’t have extra room in our apartment. 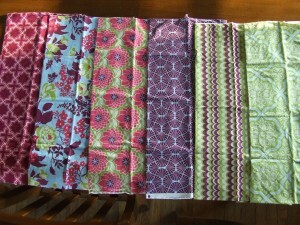 Although I guess I did just recently buy some fabric to make a skirt for Mr. Baby’s crib. I have two months left to get that made, although it better not take that long! No fabric to show/tell this Friday, but maybe next!